The browser enforces the Same-origin policy to avoid getting responses from websites that do not share the same origin. 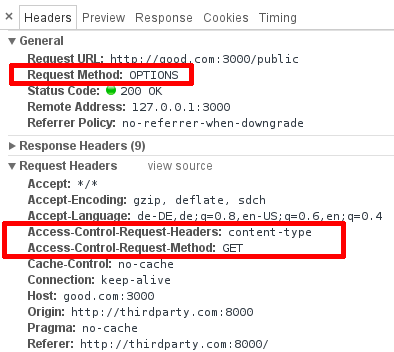 CORS headers allow access to cross-origin responses. CORS together with credentials require caution. CORS is a browser-enforced policy. Other applications aren't affected by it. I will only show the request handling code here, but the full example is available on Github. We use this to protect some private data we made available to our users at /private. But that doesn't work in our browser! Aha! We are missing the Access-Control-Allow-Origin header. But why do we need it and what is it good for? For instance: If you are on example.org you would not want that website to make a request to your banking website and fetch your account balance and transactions. The Same-Origin Policy prevents exactly that. So http://example.org and http://www.example.org and https://example.org are three different origins. Note that there is a class of attacks, called Cross Site Request Forgery that is not mitigated by the Same-Origin Policy. In a CSRF attack, the attacker makes a request to a third party page in the background, for instance by sending a POST request to your bank website. If you have a valid session with your bank, any website can make a request in the background that will be carried out unless your bank uses counter measures against CSRF. For example, an API that allows sending emails by doing a POST request would send an email, if we give it the right data - an attacker doesn't care about the result, they care about the email being sent which it will regardless of the ability to see the API response. The previous example was a so-called simple request. Simple requests are GET or POST requests with a few allowed headers and header values. But this breaks thirdparty.com again! Any other header that isn't allowed for simple requests requires a preflight request. This mechanism is meant to allow web servers to decide if they want to allow the actual request. The browser sets the Access-Control-Request-Headers and Access-Control-Request-Method headers to tell the server what request to expect and the server answers with corresponding headers. Now thirdparty.com can access the response again. Now let's assume that we are logged in on good.com and can access the /private URL with the sensitive information. With all our CORS settings, can another site, say evil.com get this sensitive information? No matter if we are logged in to good.com or not, we will see "Please login first". The reason is that the cookie from good.com will not be sent when the request comes from another origin, in this case evil.com. But again this won't work in the browser. That is great news, actually. Imagine any website could make authenticated requests - the request will be made but won't send the actual cookie and the response is inaccessible. So, we don't want evil.com to be able to access this private data - but what if we want thirdparty.com to have access to /private? But this will still not work. It's a dangerous practice to allow every authenticated cross-origin requests. The browser does not allow us to make this mistake this easily. Now http://thirdparty:8000 has access to the private data as well, while evil.com is locked out. Now we have allowed one origin to do cross origin requests with authentication data. But what if we have multiple third parties? Again: Do not directly send req.headers.origin as the CORS origin header. This would allow any website access to authenticated requests to your site. There may be exceptions to this rule, but think at least twice before implementing CORS with credentials without the whitelist. In this article we've looked at the Same-Origin Policy and how we can use CORS to allow cross-origin requests when required. This requires server- and client-side settings and depending on the request will cause a preflight request. Additional care should be taken when dealing with authenticated cross-origin requests. A whitelist can help to allow multiple origins without risking to leak sensitive data (that is protected behind an authentication).